Going fast in a straight line is one thing, but as sports car people, there is no way we’re going to own one of America’s great pinnacles of performance–the Shelby Mustang–without making it handle a bit better. Our 1967 Shelby GT350 still needed some work in this department. That said, we couldn’t just tear into a genuine Shelby Mustang and start hacking away. This car has become a very serious classic. Purists will scream that we shouldn’t have modified this car at all, but ours was no creampuff to begin with. 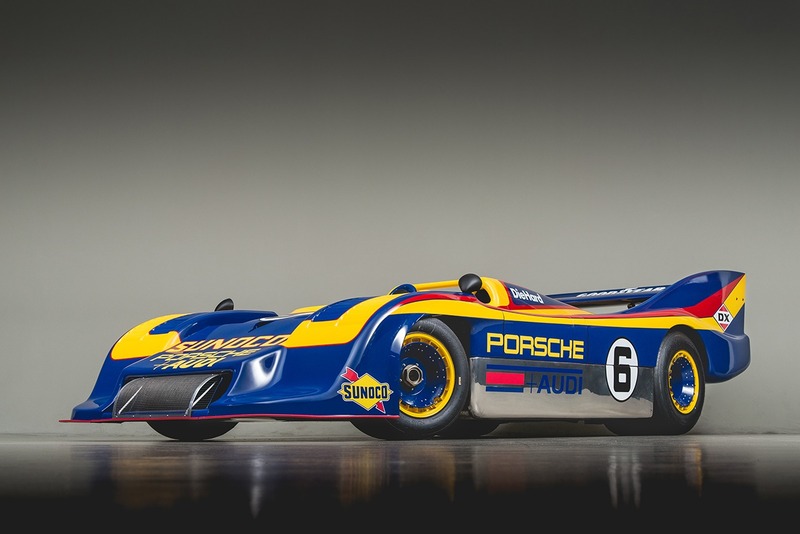 Plus, those purists have never driven a car with power steering this hateful. We did practice some restraint, though. Our goal was to keep this one very streetable. We’ll be tackling some long-distance rallies, so the car still has to bolt down the interstate with finesse. Read more about our Shelby GT350 and our other projects in the pages of Classic Motorsports Magazine. 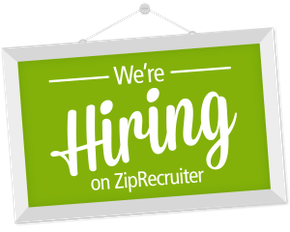 Click here to try an issue for free—no credit card info needed. Our shorter Ididit steering column is the correct length for either steering upgrade: power or rack-and-pinion. There’s even a tilt feature, which our original column didn’t have. To give the suspension a real workout, though, we set up a test day at the Florida International Rally & Motorsport Park, a 1.6-mile test track. 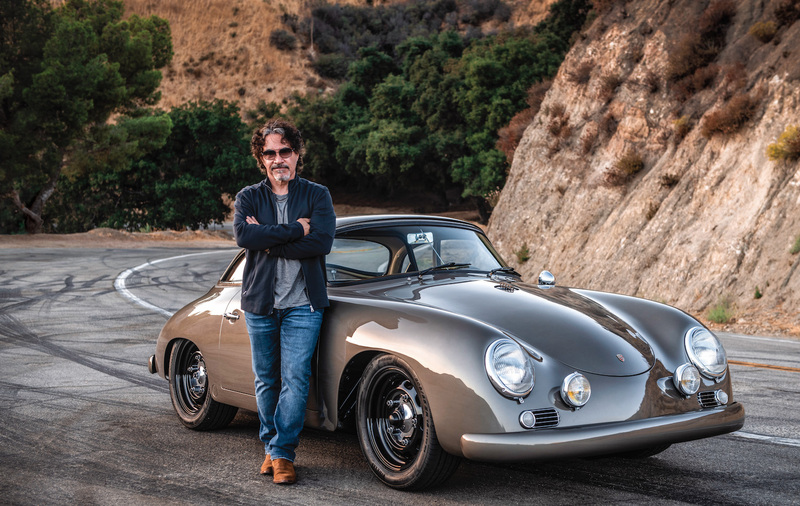 The first thing we noticed at speed–and to be honest, it didn’t come as a big surprise–was that the factory power steering simply couldn’t keep up. In fact, after just a few laps, it started hemorrhaging fluid at an alarming rate. This was actually our third power steering failure. Despite having it professionally rebuilt by Orlando Mustang, it continued to plague us with problems. Its days were numbered. While our 225/60R15 Kumho Ecsta ASX tires were pretty darned good for street use, this all-season rubber obviously wasn’t designed for track work. They complained in every turn while the Shelby’s nose tracked for the outside edge. We needed something stickier, even if that meant shedding our 15x7-inch wheels. Our Shelby also needed more brakes, as the stock ones simply couldn’t handle the heat generated on track. At 11.3 inches across, the 1967 Shelby Mustang has some of the largest front disc brakes fitted to any Mustang until the 1995 Cobra. Still, on track, the brakes soon faded. Plus, our original rotors were at the end of their service life. Since there are so many effective, reasonably priced brake upgrades available for these early Mustangs, we figured we’d shelve the stock brakes and seek something better. Our final issue with the car was that we couldn’t dial out the understeer–tire pressures and shock absorber settings couldn’t cure the push. When run hard, the Shelby understeered quite badly. In a street car, a little understeer helps keep things safe; on track, being able to induce a bit of oversteer with the throttle makes things more fun. 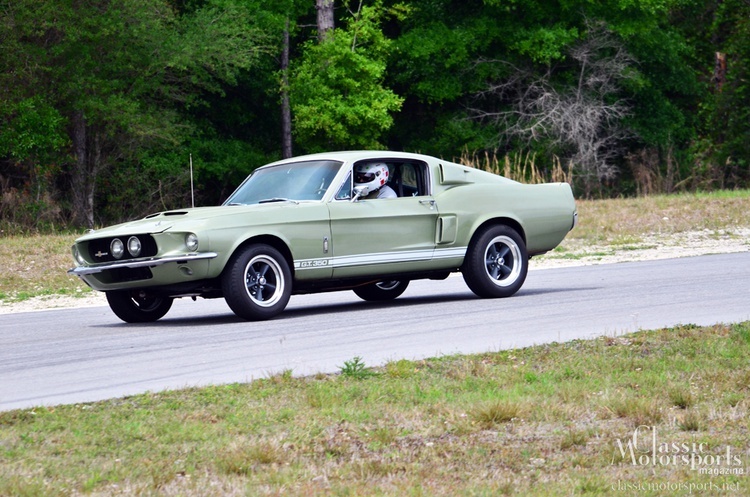 Despite these complaints, we were surprised by how well our Shelby handled a race track. As you may imagine, power was not an issue. Our car had that in spades. The chassis basics were pretty decent as well. Our 550 lbs./in. front springs seemed to offer a good balance between street comfort and decent race track manners. 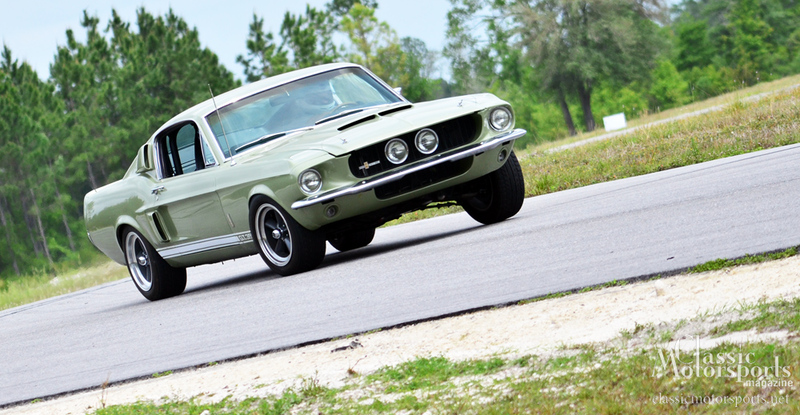 Our limited-slip differential helped us plant the 500-odd horses from our Ford Racing crate engine. And finally, our Koni dampers controlled the antiquated chassis better than we anticipated. Once everything was apart, we planned to add a little more negative camber up front to increase traction. The original, power-assisted steering system (top) helped make our Shelby miserable to drive. 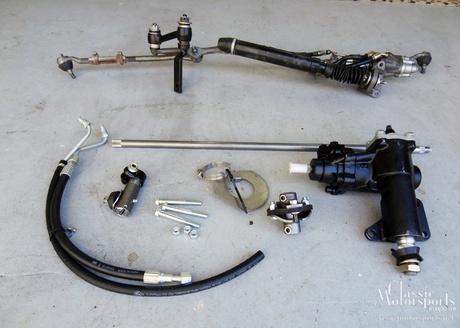 Our solution: a super-slick Borgeson power steering conversion kit (bottom). Moderately successful testing sessions under our belt, we headed back to the shop to map out a plan and make some changes. First, we looked at our dreaded steering. The original 1965 Shelby Mustang came with a manual worm-and-sector steering system. Shelby’s answer to provide more precise steering was to install the quicker-ratio (16:1) power steering box along with shorter, quicker steering arms. While this worked well for track use, an early Shelby is a bear to parallel park. One of the reasons we opted for the 1967-model Shelby is that we liked the idea of a slightly more comfortable car fitted with power steering, power brakes and air conditioning. We could have done away with power steering and duplicated the early Shelby mods, but we were not willing to give up that comfort on long-distance rallies. The original Ford power steering from the ’50s and ’60s uses an awful tangle of rams and hoses to assist the manual box. In the end, the hoses leak and the feel is horrible. We’d heard good things about a modern power steering improvement kit offered by Borgeson, an OE supplier of a hundred years. Since this solution bolts on, it would be reversible should the need arise. National Parts Depot sells this kit for about $850. 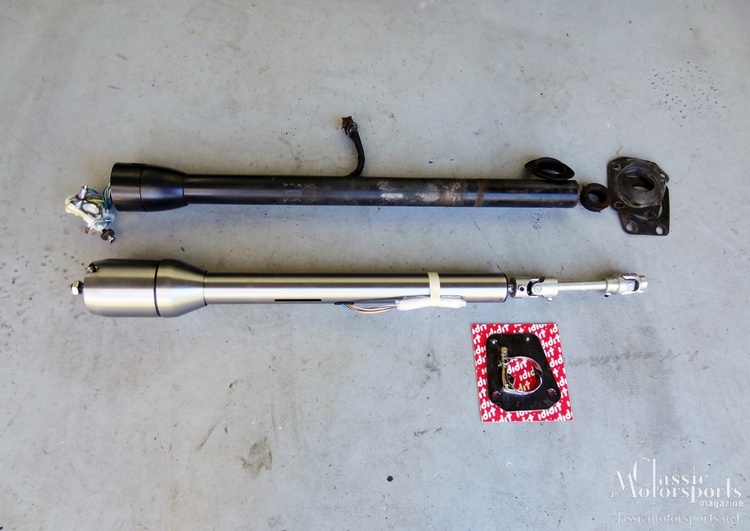 The Borgeson kit replaces the steering box itself with a rebuilt, true power steering box of a later, ’70s-style Ford design. This kit is also nearly undetectable. Unless the observer really knows Mustangs, the Borgeson setup looks like it came straight from the factory. Installation was straightforward, and getting rid of all the old hydraulics eliminated our leaks, increased ground clearance, and shed nearly 15 pounds from the nose of the car. However, we needed to make one modification: shortening the original steering column. Even though it’s a standard Mustang piece, we were reluctant to cut our original Shelby column. One of our partners, Steeroids, recommended a new, complete column from Ididit Incorporated. This beautifully made column came in chrome, but we painted it black to match our original interior. This column was prewired with a turn signal switch and cut perfectly to fit either the Steeroids rack-and-pinion kit or the Borgeson power steering conversion, making it a real time-saver. It was also time to re-evaluate our tires. We originally fitted some OE-sized, 15x7-inch Torq Thrust-style wheels with 225/60R15 tires. When we looked for stickier rubber, we faced a small dilemma: Nothing was available. In fact, Tire Rack only lists four tires in that size, all of which are all-seasons. To get sportier rubber, we needed to upsize the rim diameter by an inch and opt for a 225/55ZR16 tire. This size greatly opened up our options, with Tire Rack offering 66 models. Despite the larger rim diameter, the overall tire diameter barely changed. We wanted to keep the same look, so we settled on a V45 wheel from Vintage Wheel Works in a 16-inch diameter–7 inches wide up front and 8 inches at the rear. The backspace is 3.75 inches on the fronts and 4.5 inches out back. We felt they represented a good value at less than $1000 for the set. For rubber, we ordered a set of BFGoodrich g-Force Sport Comp-2 tires. This is a contemporary, ultra-high performance summer tire. It doesn’t look too modern, though, so the set won’t spoil our Shelby’s looks. The g-Force Sport Comp-2 also comes in a wide range of sizes, from a 195/50R15 up to 20-inch rim diameters. They’re fairly priced, too: Tire Rack sells them for a little more than a hundred bucks each. It also gives us a Z-speed rating, meaning it’s good for more than 149 mph. While our Shelby is quick, we don’t expect to be going that fast any time soon. Everything fit as expected, although we did have to roll the front fenders a bit to avoid rubbing issues. The Wilwood kit comes disassembled, but installing the wheel studs and assembling the rotors and hubs was a straightforward process. Once we had the kit together, we could install it on our Shelby. The next item on our to-do list: better brakes. Ours had reached the end of their service life. Plus, those original calipers were heavy. Wilwood makes a beautiful, lightweight, six-piston brake upgrade kit that bolts right onto early Mustang spindles. The whole kit sells for less than $1100 at places like Summit Racing. In addition to forged six-piston calipers, the kit comes with nicely made, lightweight aluminum front hubs and 12.2-inch vented rotors. Wheel bearings and even braided-steel brake hoses designed to mate the new kit to your old Mustang were included, too. We’d get more heat capacity while shedding rotational and unsprung weight. Installation is a very simple process. First, of course, remove the old front brakes. Then, assemble the rotor hats, mount the caliper brackets, pack and assemble the wheel bearings, and bolt everything together. 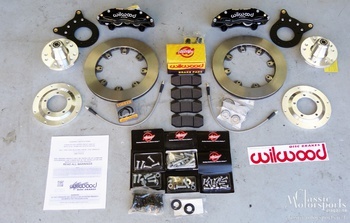 The kit comes with Wilwood’s Smart Pad brake pads that we’ve found to be excellent for street and light track use. They have good initial bite and exhibit little squealing and dusting. We’re not the first ones to experience understeer in an early Mustang. Shelby had the same problem, too. To fix the issue, he lowered the upper control arms on his early cars by about an inch. That increased the negative camber and lowered the center of gravity. It also raised the roll center, thus reducing body roll. To make this modification, we used a kit from Cobra Automotive that includes steel templates, hardened drill bits and complete instructions. You could also find the specs online or in old magazines. After tearing up two sets of cheap, reproduction strut rod bushings, we replaced them with urethane units sourced from National Parts Depot for around $20. We were warned that these would make the car uncomfortable, but we haven’t noticed any issues. These bushings nicely tightened up the front end and have held together perfectly over several thousand miles of driving. Once we installed the hardware, we could have the chassis aligned, adjusted and corner-weighted. Our goals were simple: extra front negative camber to help aid grip, a lot of caster to improve road feel, and a little toe-out for quicker turn-in. Thanks to our new control arm setup, we were able to get more than a degree of negative camber at the front, while caster was set at about 3.5 degrees. The Borgeson folks recommended that as their minimum caster angle. Finally, we had to set toe–the relationship of the front wheels when viewed from above. For track use, we’ll set about 1/8 inch of total toe-out. For more comfortable road use, we’ll set toe at zero, meaning the front wheels will be exactly parallel. Toe-out makes a car turn in quicker, but it also encourages tramming or wandering on the highway. We always set our Koni shocks in the middle of their adjustment range when starting out so we have some leeway in either direction. Some high-speed testing, showed us that they needed to be set nearly full-stiff in both the front and rear. This did much to improve high-speed stability and further reduce understeer. We also put the car on our Longacre scales to see how the car’s weight is balanced on the chassis. A 49.39-percent cross-weight means the weight distribution pretty well even from right to left. A 50-percent cross weight is ideal, but for a production street car we figure we’re close enough. The total weight isn’t bad either. Sure, we could have stripped the car of its air conditioning and other comfort items and gotten another couple hundred pounds out of it, but we aren’t willing to do this. What is it like to drive now? Wow. What a difference a bit of research, a little time, and some carefully chosen parts can make for old muscle cars. For well under $5000, we’ve gone from wanting to sell this car–yes, the steering was that bad–to considering it our favorite in the fleet. We put the new suspension to the test during a recent 3000-mile trip: We drove from California to Montana, then participated in the Going to the Sun Rally. Not only does the car now handle much better–we can even rotate the rear end at will–but our confidence behind the wheel has improved greatly. Plus, it didn’t suffer any degradation in ride quality or increased noise levels. One issue did crop up, though: The Ford steering pump failed. Borgeson again came to the rescue. They’d already helped us upgrade to a modern power steering box, and now they had the hardware to install a GM-style pump that flows more evenly at all rpm. The Borgeson steering pump conversion kit installs quickly and easily, so we can change it back if we ever decide we want the car to steer badly again. We now have a car that rides and drives wonderfully, is easy to live with, and is ready for any rally or track day. Mission accomplished. Join Free Join our community to easily find more Ford and Shelby articles. 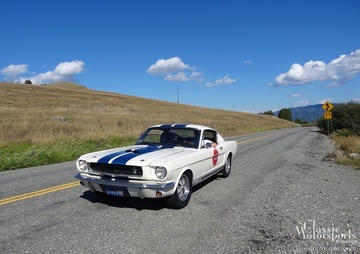 How does our rally-prepped 1967 Shelby compare to the original one? During the Going to the Sun Rally, we got do a little back-to-back comparison. 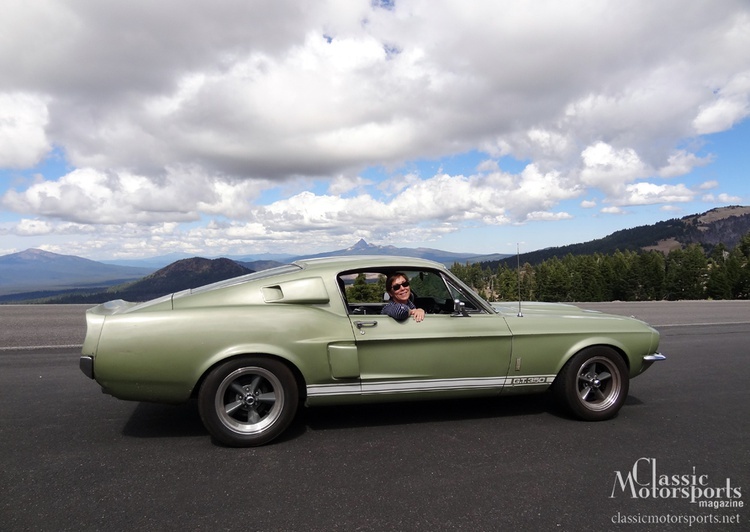 Brad and Lisa Tank brought their all-original 1965 Shelby and welcomed the opportunity to swap rides for a bit. The Shelby legend was born on the race tracks during the 1965 season. By the time our car was built, the focus demographic had shifted to the business executive seeking a fast yet comfortable GT car. Upon entry, we immediately noticed how Spartan the original Shelby is. From the seats to the door panels, the original is just plainer. That said, the early car is obviously smaller and lighter, and this immediately became more apparent once it started to move. Also evident was how much more direct the early car is. The brakes took great effort to activate, and at rest the steering was very heavy. Once the early Shelby was underway, the side exhausts–which, the owners confessed, needed new mufflers–quickly reminded us just why the Shelby legend grew. For short distances, the noise they emit is magical; however, after multiple days of driving, as the Tanks admitted, it’s not so enchanting. Still, the original car did seem more like a sports car than our later model. The feel was tauter and the ride considerably rougher. How did the 1965 Shelby owners like our car? Brad said the power steering took some getting used to, but he felt that our car handled quite well. Not surprisingly, he also had nothing but praise for our big engine. Don’t forget, we nearly doubled the horsepower. We came away from this comparison with mixed feelings. We still love the look and feel of the original Shelby, but in the context of a rally, our 1967 model and its modifications made us very pleased.